Oil prices dropped as Saudi Arabia pledged to keep a decent market supply. Recent lows were retested after Saudi Arabia pledged to play a responsible role in energy markets despite the increasing tensions with the US. Furthermore, Saudi's Al-Falih informed markets on Monday that the Kingdom has no intention of reducing supply in retaliation to potential sanctions over the incident in Turkey. However, the downside in gold prices dropping will be very limited due to concerns that OPEC heavyweights may not be able to compensate for the drop in Iran's crude exports post-US sanctions. Oil prices broke below the $70 level after breaking the long term purple trend line to downside and settled just above the $69.5 level. 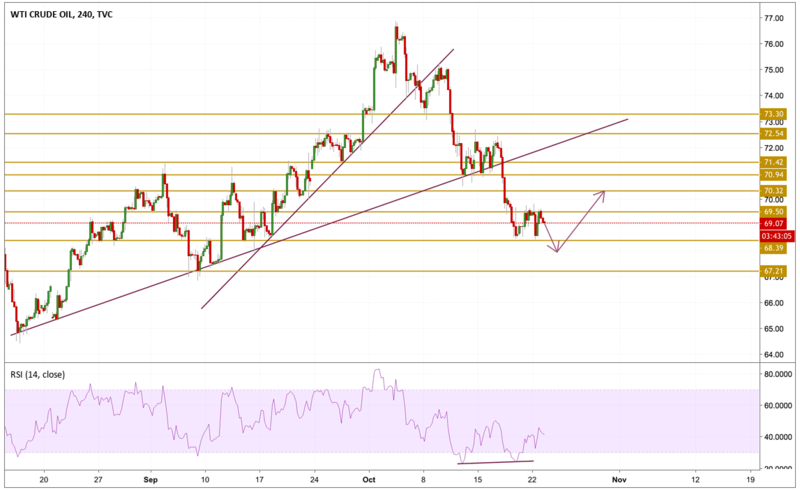 The RSI is pointing towards a huge divergence of the momentum with the price so a little pullback or a retest of the recently penetrated $70.3 level is expected to occur but after it tests the $68 level.